Best frenemies is how Barack Obama and Hillary Clinton have ended up after political battles and later reconciliation left them closer than ever. 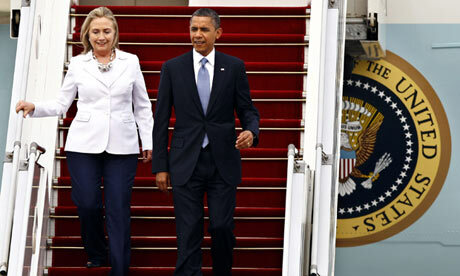 President Obama insisted that Clinton accompany him off the plane in Asia on her last trip abroad with him. Earlier the two had spent hours in Air Force One together, in his personal office talking about the old days and no doubt, the future. The old days were tough for the twosome. They fought a bitter and nasty primary fight but then it was all kiss and make up as Hillary became his Secretary of State. She did a damn fine job too. She traveled endlessly, worked herself to the bone and the world was a safer place. Obama knew he had hit the jackpot and left her to her own devices -- and it was the making of a very successful partnership. Then, of course, there was the matter of her husband bailing out the Obama campaign at key moments in his presidential race against Mitt Romney. Without that help in a close race it is doubtful he would have won. So all is well that ends well as Hillary heads for retirement -- or does she? I wonder what would have passed between them on that flight to Asia? Barack will surely be asked three years from now when the New Hampshire hills loom again and the 2016 race gets underway as to who he will support. He won't say openly but if Hillary decided can he really deny her? That’s what frenemies are for after all. The kiss and make up is the best part.